Last year, GPI reported that electric vehicles provide a greenhouse gas (GHG) reduction of at least 42% to 61% compared to gasoline vehicles in Minnesota based on data for the year 2015. Further analysis performed by GPI with updated 2016-2017 data now shows that electric vehicles provide GHG reductions of at least 65% in Xcel’s service territory in 2017 and at least 53% in the greater MISO North Region. 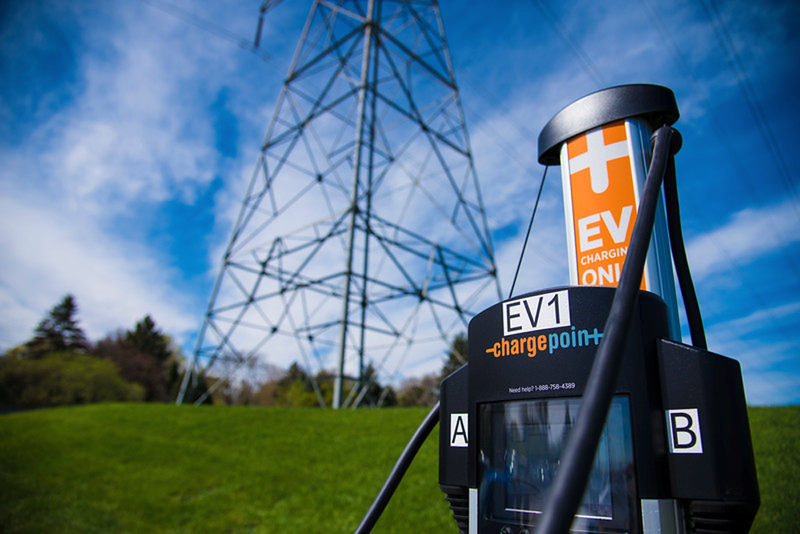 Already an improvement from GPI’s 2016 analysis, these emission reductions are set to increase through the year 2030, when an electric vehicle (EV) charging in Xcel’s territory will result in a per-mile GHG reduction of 75%. Like last year’s analysis, GPI again utilized Argonne National Laboratory’s GREET Lifecycle Model to calculate emissions from gasoline and electric vehicles. The results included emissions for the full lifecycle of a vehicle, including vehicle and battery manufacturing, fuel production and refining, and vehicle operation or fuel combustion. The improvement in GHG reductions was largely caused by two factors: updated generation fuel mix projections from Xcel that include significant new wind capacity and the use of more specific generation fuel mix data published by MISO for the MISO North Region. Figure authored by Great Plains Institute. May, 2017. Since our 2016 analysis was published, Xcel announced plans for 1,550 MW of new wind capacity and has agreed to close the Sherco 1 & 2 coal generators by 2026. 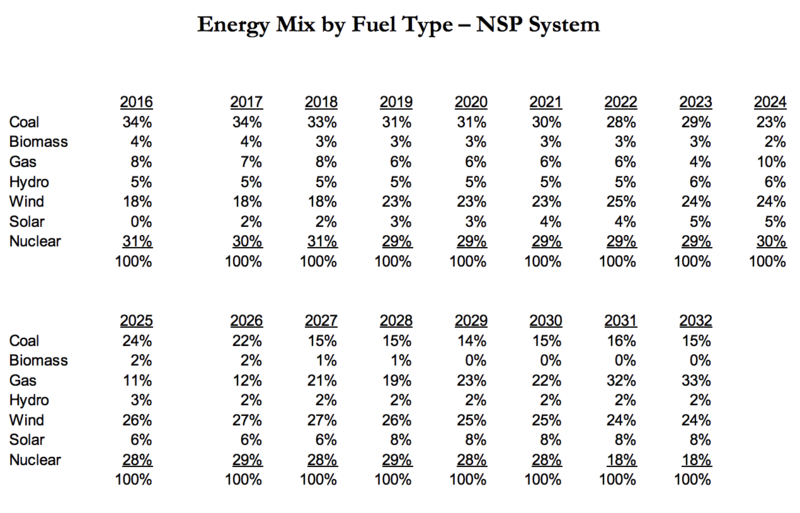 In a subsequent response to a Minnesota Public Utilities Commission information request, Xcel listed detailed projections for the generation fuel mix on its NSP System for 2016 to 2032. These projections show a decrease in coal’s generation share from 34% in 2016 to 15% by 2030, along with increases in wind and natural gas. As a result, electricity in Xcel’s service territory will see large reductions in GHG intensity over the next 15 years. With these figures, GPI was able to update its calculation of GHG intensity for EVs. 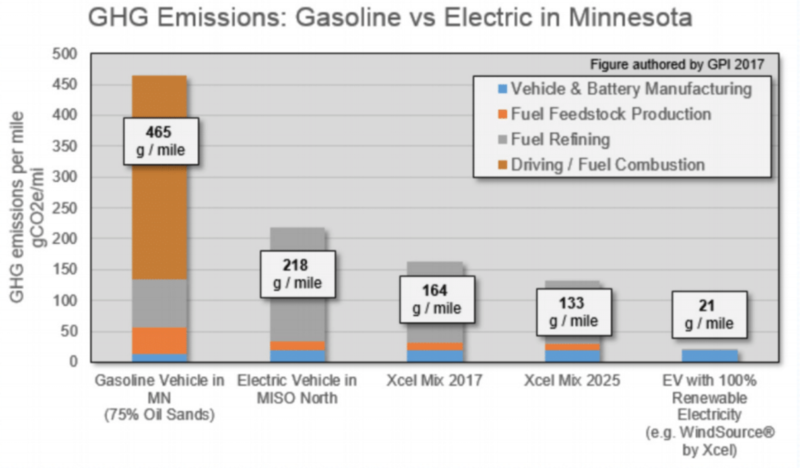 An EV charging in Xcel’s service territory will produce 163.5 grams of GHGs per mile (g/mile) in 2017, and only 118.5 g/mile in 2030, compared to a gasoline GHG intensity of 464.6 g/mile. 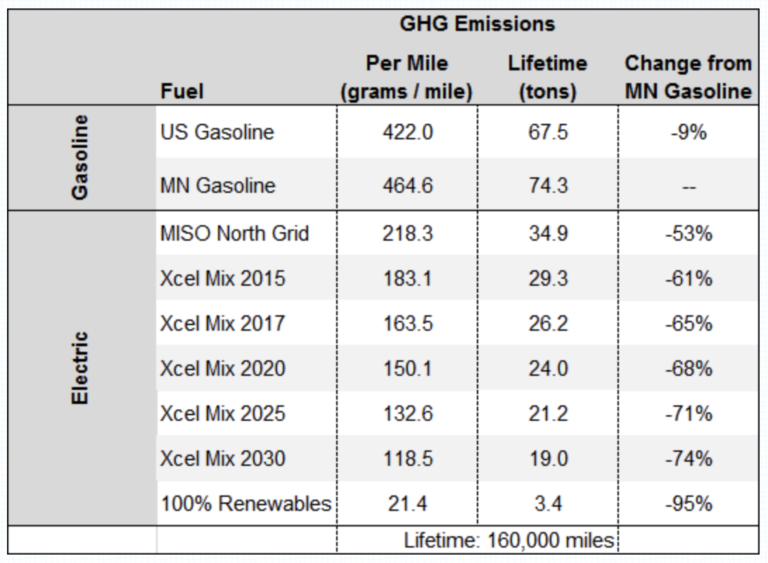 For those EVs outside of Xcel’s Service territory, the generation fuel mix of MISO’s North Region provides a good estimate for GHG intensity across the Upper Midwest. 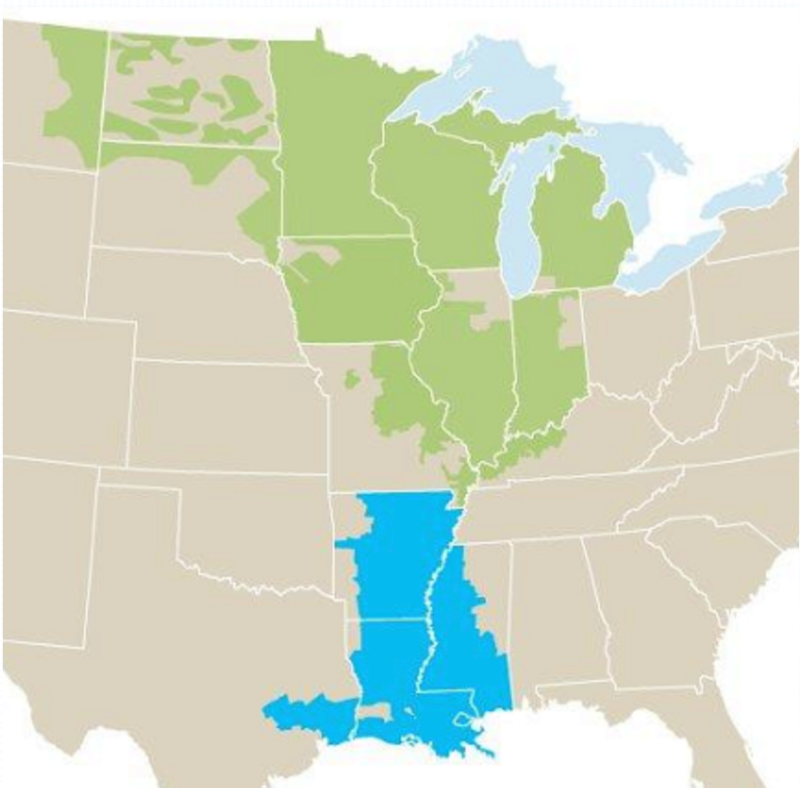 Our previous analysis used the fuel mix from the entire MISO region, which includes fossil fuel heavy states such as Arkansas, Louisana, and Mississippi in the South Region. Further study of the MISO region has indicated that a significant transmission barrier exists between the South Region and MISO’s North Region, where wind power is more prevalent. While MISO is currently scoping transmission improvements that would improve the flow of electricity between these regions in the future, the most accurate current estimate for electricity in the Upper Midwest should use MISO’s North Region. In 2016, MISO reported a fuel mix for its North Region of 28% wind power, 48% coal, 14% nuclear, 8% nautral gas, and 2% hydro. This results in a GHG intensity of 218.3 g/mile for EVs in the MISO North Region, compared to last year’s estimate of 267.9 g/mile for the entire MISO territory. This update to GPI’s 2016 analysis based on 2015 data has found that the GHG benefit of EVs has already improved, with a reduced GHG intensity from 183.1 g/mile in 2015 to 163.5 g/mile in 2017 for Xcel’s service territory. This means that even when including vehicle and battery manufacturing, EVs already provide a 65% GHG reduction from gasoline and are set to provide a 74% GHG reduction by the year 2030. Outside of Xcel, EVs provide a GHG reduction of at least 53% from gasoline across the Upper Midwest, while an EV powered by renewable energy still provides a 95% GHG reduction. MN House Research Dept. ; Xcel Energy; MN PUC; MISO. Acknowledgements: Thank you to Andrew Twite at Fresh Energy for feedback on Xcel and MISO fuel mix.